Yet amidst all the acclaim from highly-regarded news outlets such as Kelly Blue Book and Motor Trend, tons of design awards, and being the posterchild of Cadillac’s “Art and Science” theme, the CTS is still missing something; and that would be a mid-level engine option. The CTS range currently has a continental rift between the 304-hp 3.6L V6 engine (now SAE rated at 312hp) and the explosive 556-hp LSA motor. That’s not to say that both engines aren’t great; the might of the LSA cannot be argued. The only problem is that for some, it’s too mighty. And even though the high-feature 3.6L V6 carries impressive credentials, it still isn’t spicy enough to satisfy the tastes that crave a vehicle with a power output of somewhere between 350 and 430 horsepower. Furthermore, competitive models such as the Lexus G460, Infiniti M50, BMW 550i, Audi S6, etc. offer the option. The General can address this problem effectively and efficiently. It has a vast arsenal of engines and a few are well-suited to fill the void. Specifically, the much-respected 362hp L76 (last featured in the late Pontiac G8 GT) and the brawny 430-hp LS3 as well as its automatic transmission variant, the 400-hp L99 (both currently in the 2010 Chevy Camaro SS). 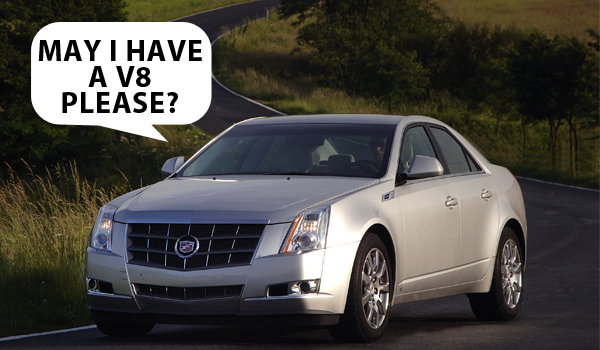 Though we have yet to cover this topic in our Debate Podcast series (update: we will do so), the point is that the Cadillac CTS needs to offer another V8 engine besides the thunderous LSA V8. The present-generation CTS model isn’t going anywhere for a few more years. So in order to keep up with ze Germans (Mercedes-Benz E Class, BMW 5 Series, Audi A6) as well as Japanese competitors (Lexus GS and Infiniti M), Cadillac will need to do something to keep its prodigy fresh in the minds of midsize luxury sedan buyers besides sales events and promotions. The CTS Coupe will begin making its way to dealerships later this year and a secondary V8 will allow it to better compete with the BMW 6 Series, E550 Coupe, and Audi S5. The gen-II CTS is not at the end of its lifecycle – it still has a few more years to go before a replacement on the lighter and more flexible Alpha platform will take over and bring with it the mysterious 8-speed transmission. And let’s not forget that the current-gen CTS hasn’t even received an update since its introduction in 2008. Perhaps these engines are something to look forward to in a mid-cycle refresh that should be coming up in the next year (or so we’d imagine). In any event, GM should do well and take care of one of the best cars it has ever spawned – or else it may get blitzkrieged by its German rivals. This post is part of the GM Authority Opinion Desk series, where you can see exactly what’s on the minds of GM Authority writers and editors. Previous story GM Authority Debate 9 – Should GM Operate Its Own Dealer Network? Yes…an LS3 CTS All Wheel Drive Sport would be awesome! That said since the LS3 costs less to build and has 132 hp more in my 08 vette.. I know what a sweet motor that the LS3 is so its hard not to dream..
AWD LS3 CTS would ROCK! I’m not sure an AWD system can be crammed in with the large LS3… maybe a twin-boosted six? OR; a twin scroll turbo bolted on the existing 3.6, should be good for another 35-50 HP, as well as improving it’s low end. I’ve got a 2010 Sport Wagon, which on the hwy, it’s upper end has all the good stuff; power, and yes, even sound, but around town this engine in a $54,000. piece is border line shameful.